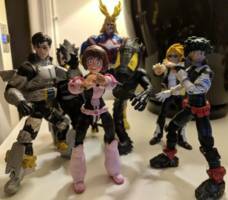 This is another my hero academia custom figure I made, this took a while to make but I did finish. His coustume is a mix between fist first and second coustume, mostly being the second one but with elements of the first, like his jacket being longer, I am going to try and make his wrist shooter and visor in the future. Another thing I need to say I'd that this is not perfect at all, the part I can definitely improve I'd is hair and face, feel free to give me feedback on what I can do better for this figure I'd really appreciate it, I hope you enjoy.